Between January and March 1944 Jim travelled back to the UK by some means and must have been given leave very soon afterwards because his next letter reported his safe arrival in Worthing after seeing Pip and meeting his son Dave for the very first time. Dave would by now have been over 2 years 7 months old. Jim was billeted in an ex-hotel on the sea front along with the squadron that he had last seen in Italy, in December, before he was taken ill. There was mail awaiting him that had followed him back from Italy. Much of the contents of the letters Jim sent to Pip before D-Day consisted of arrangements for Pip to visit Worthing, which she did twice, leaving their son Dave with his grandparents at 20 Anfield Road. Jim was able to arrange a sleeping-out pass but warned Pip that he would be very busy during the days. He wrote about two diversions from his normal working days - one welcome, the other decidedly not so. “The Brig gave us a little lecture after the inspection – honestly Pip – I sometimes wonder if such people are as far away from the feelings of their rank and file as they appear from their talk. He told us how lucky we were to have had this little glimpse of Home." I’m not sure how close to verbatim the following is but Jim clearly didn’t think much of the Brigadier's lecture, however it was expressed. On 17 April Jim reported that “… we are going all hush hush...”, when he invited Pip for her second visit to Worthing, and he was unsure that his expected leave would ever materialise. Rather than heading his letters with “Worthing” and the date, he now reverted to a full army address and the envelopes were once again stamped by the censor. Pip did visit towards the end of April. 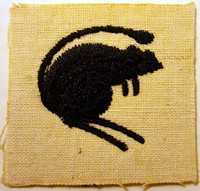 Jim sent a brief letter on 29 May promising some chocolate and enclosing a cloth desert rat. Then on 31 May he wrote that “pressure of work has been ‘orrible”. After a few complaints about the late arrival of a pay rise (“Everything is the same Pay, Allowances, Bonuses, even Service Stripes and decorations – lob ‘em out because the troops need a fillip.”), the weather (“positively scorching”), the old lady across the road (“one can almost hear her crooning over her coins as she claws them from the counter”) he reported that he had just handed in his old battledress. Perhaps this was the final indication that the Brigadier’s “fun” was imminent because he signed off more emotionally than usual. 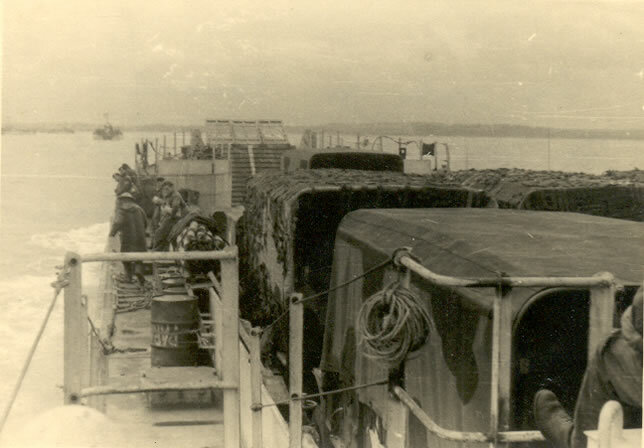 The three photographs below, taken en route for Normandy on D3, as Jim described the day, show the tightly packed flat-bottomed landing craft that were used to cross the Channel. Even Jim, who was never seasick, described the crossing as "a bit rough and not a little uncomfortable". "Outward bound from unknown beach near Southampton for unknown beach elsewhere D3"
"Mid-Channel D3" . 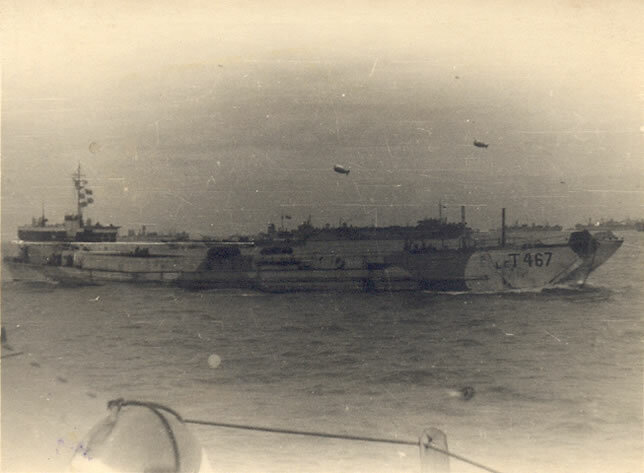 Note the ships filling the horizon and the barrage balloons. Jim had already received a letter in France, from his brother Dave, who said he was “near the place we left in Italy”. He went on to describe what he saw around him, minimising any mention of the war. 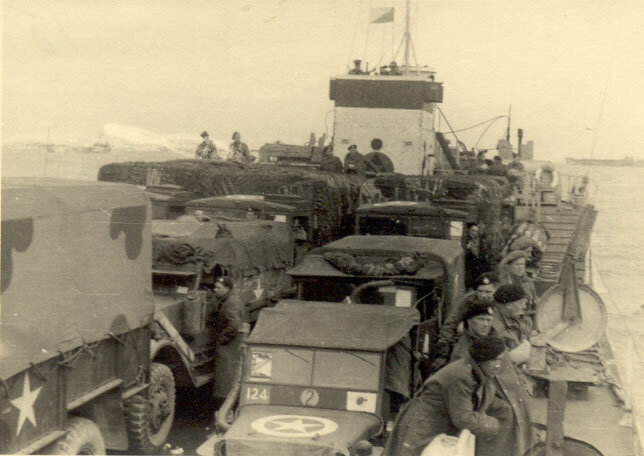 "En route for Normandy - the approach to the beaches D3. Ahead is 'N' beach. Jerry is 5 miles inland"